Sandy the Troublemaker, pt 4: the phasing begins! Growing up on the Jersey shore, I would wonder whether it was ever possible for a hurricane to come in off the ocean and hit NJ head-on. Oh, my naive youth! I guess Sandy is about to show us that anything is possible! Today’s post is more to show you some of the great tools we are using to help analyze the large-scale pattern interactions with Sandy. Please note that even though the latest NHC forecast philosophy calls for Sandy to become post-tropical (no longer considered a hurricane) about 120 miles off the NJ coastline, there will be winds close to hurricane strength near the NJ coastline, while farther inland hurricane force gusts are certain a good possibility! GOES-14 visible imagery in super rapid scan operations (SRSO) with 1-min lightning overlaid courtesy of the Vaisala GLD-360. 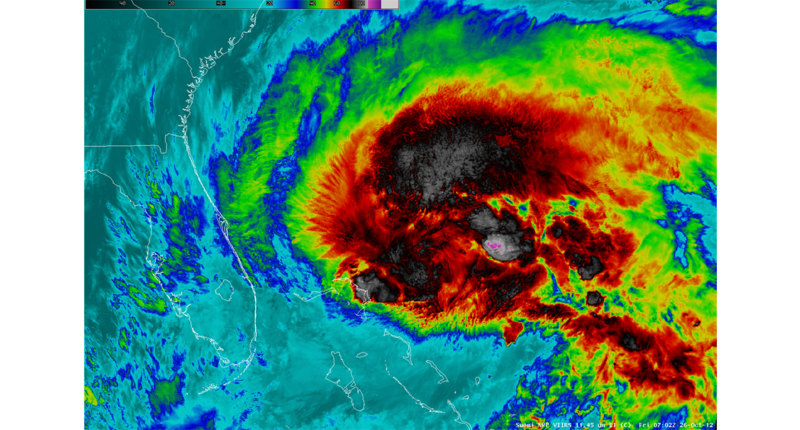 The animation above (click on the image to open in a larger screen) shows us a special GOES-14 super rapid scan of Hurricane Sandy on 10/27/12 with 1-min lightning overlaid. Notice there is very little lightning and much of it is in the arcing band to the north and east of Sandy’s center. This imagery is being used at HPC and the Ocean Prediction Center (OPC) during this entire event to showcase future capabilities of GOES-R. This helps forecasters monitor convective trends near the core and outer bands as Sandy transitions to a hybrid storm. For a longer loop, minus the lightning: http://tinyurl.com/955fvvd. Thank you to Timothy Schmidt from NESDIS STAR for providing the animation! GOES-Sounder RGB Air Mass product with features highlighted valid at 20z on 10/27/12. The GOES-Sounder RGB Air Mass product above continues the story-line I started a few days ago. The shortwave (upper-level low circled in red) that is responsible to tangling Sandy with the Mid-Atlantic is now diving southeast at a rapid clip. This low (red “L”) will continue east-southeast overnight and you can see the effects of its influence on Sandy by the fanning out of the upper-level clouds to the west-northwest. As this occurs, Sandy (black “L”) will first move north-northeast into tomorrow, before being captured by the aforementioned shortwave. I highlighted in the yellow-circle some obvious dry air (red-shading) in the Sandy’s eastern quadrant. This is indicative of significant drying at upper-levels, most likely associated with a stratospheric intrusion, which has assisted in the hybrid nature of Sandy. Although not shown today, the blocking in the Atlantic is already causing a significant atmospheric traffic jam. The large ocean storm is still moving southeast and the upper ridge will block any possible escape of Sandy, therefore allowing this highly unusual northwest-west track into either DE or NJ. The MODIS RGB Air Mass product valid at 1828z on 10/27/12. The final image today is courtesy of the MODIS instrument on NASA’s AQUA satellite. This version of the RGB Air Mass product is much higher resolution than the GOES-Sounder version, but it is a polar orbiter, therefore you only get a few images a day. 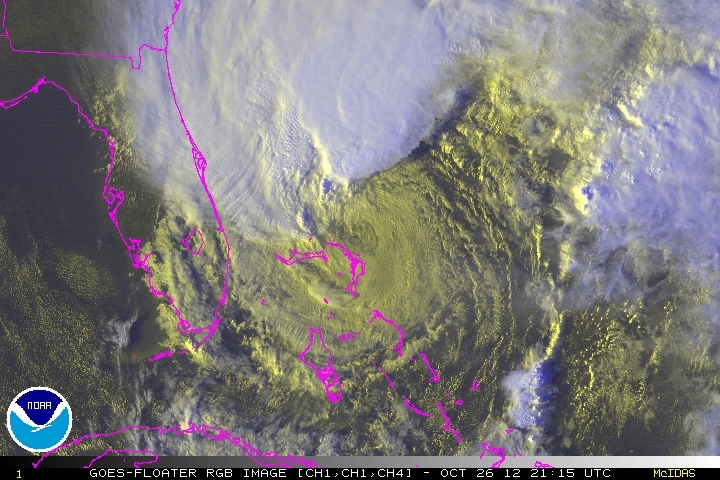 Notice the amount of red-shading wrapping around the eastern quadrant of Sandy (yellow-circle). This shows us that the tropical to extratropical transition is underway and with the added energy coming in from the west, we will likely see Sandy deepen further from its current 961 mb pressure. This means the winds could actually increase despite the classification! Hopefully everyone along the Mid-Atlantic and southern New England have made their preparations. Conditions will go downhill starting tomorrow. Again, the main impacts will be high wind, heavy rainfall, severe coastal flooding (4-8 feet in spots along the Delmarva and NJ), and mountain snows! What a storm! I will try to update the blog on Sunday morning. Thanks for reading! What to do with Sandy, Pt. III – the saga continues!? What to do with Sandy, Pt. II? As I write this, the NOAA Center for Weather and Climate Prediction is buzzing with activity as everyone prepares forecasts for what may become a significant East Coast storm. The players are on the field (meteorologically speaking) and now it’s a matter of when the atmospheric dance begins. 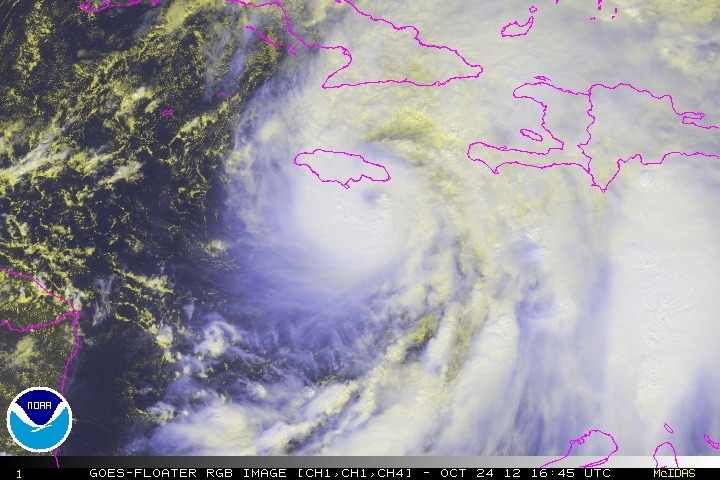 Hurricane Sandy made landfall in Jamaica and eastern Cuba last night, but appears to have used those landmasses as a speed bump with the current intensity still at 105 mph with a central pressure of 963 mb. The storm has accelerated some today, but is expected to slow and turn slightly northwest overnight into tomorrow as an upper-low to the south interacts with it. 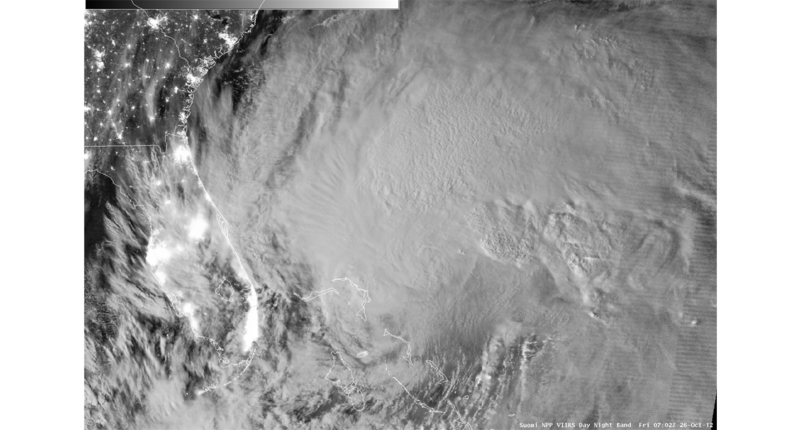 “RGB” satellite image of Hurricane Sandy on 10/25/12. The satellite image above shows a compact hurricane with a cloud-filled eye-like structure this afternoon. Notice how expansive the cloud shield is to the west through north! That is a sign of strong upper-level diffluence (air escaping away from the storm to allow for ventilation), which may help Sandy maintain its strength for a while longer before big changes occur to the overall structure. Some of these changes are already evident in the overall deteriorated organization. GOES-Sounder RGB Air Mass product overlaid with the 11 am EDT (15z) National Hurricane Center forecast track for Hurricane Sandy. The red circle highlights the trough that could lead to a big EC storm. The black circle is evidence of baroclinic (Mid-Latitude) interaction with Sandy. The GOES-Sounder RGB Air Mass product above paints an interesting picture today. The red circle highlights the trough that will play a significant role in Sandy’s evolution over the coming days. The red “L” is a vigorous shortwave that is digging into the mean trough and will help to keep pushing the entire red area east. The red-coloring in the image is stratospheric air (dry, lots of ozone) with the blue colors indicating much cooler mid-level temperatures, while the green color shows warmer mid-level temperatures (on average). 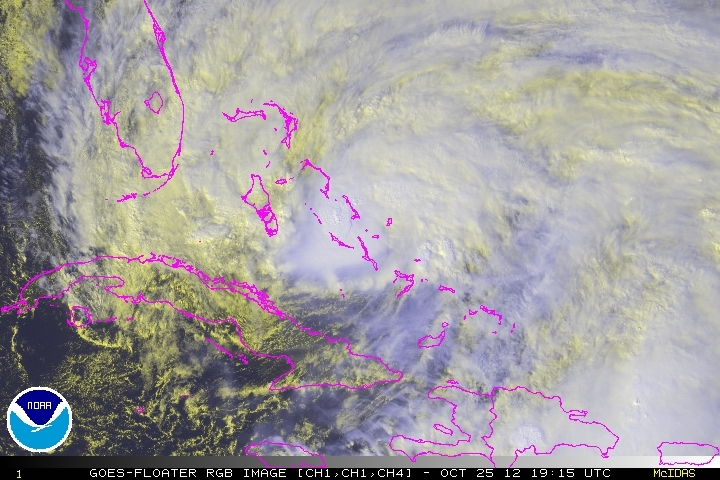 Sandy is still off the screen in the lower right, but the outflow (fanning of high clouds) can be seen well to its north. The black circle highlights some orange shading that signifies the beginning of some interaction with an upper-level low pressure to Sandy’s southwest. This would suggest that some transition to a hybrid may be starting. SEVIRI RGB Air Mass product on 10/25/12 with various features highlighted. See text for explanation. Meanwhile, farther east over the open Atlantic. . .there are many features that will play some role in our East Coast storm’s evolution. Although models have come into better agreement on a high impact event in the Mid-Atlantic/New England, how these features interact will make all the difference. The feature circled in red is a relatively deep upper-level low that has cutoff from the main jetstream and will be shifting southeast over the next few days. This may act to capture now post-tropical storm Tony (black circle) which will add some energy to an already deep system. (Note: The color shadings are the same as described above with red-coloring indicating stratospheric air and high potential vorticity or spin, blue is cooler mid-level temperatures, and green is warmer mid-level temperatures.) As this occurs, the expanding upper-level ridge of high pressure (blue circle) will continue to retrograde west as a large blocky pattern develops. This means the atmosphere will literally form a gigantic traffic jam (probably worse than what I experience in DC every day). In turn, this could force Sandy in whatever form north-northwest towards the Mid-Atlantic early next week. A fun fact. . .the red “L” is a small vorticity maxima or upper-level low that will be bounced west for days under the blocking upper-level ridge. Some models have this ending its long trip in Hudson Bay, Canada after starting yesterday in Ireland. Now that’s a blocked pattern! The weather in the Mid-Atlantic may be deteriorating early next week with high winds, heavy rain, possibly some mountain snow, and most important, the potential for significant coastal flooding. Remember, this storm will coincide with a full moon, a large easterly fetch, and of course, the storm surge with Sandy. I will do my best to keep updating this blog each day with new imagery and an update on the various systems that will determine our weather on the East Coast into next week. What to do with Sandy (10/24 version)? As I’m sure most people are aware, there is the potential for a large, nearly historic storm for the East Coast as we head towards the early part of next week, just in time for Halloween. Much of the week, forecasters have been wondering if the models have been playing tricks on them,but as of this morning’s model runs, it appears there is a growing concern for a significant event on the East Coast starting Sunday and last through the middle of next week. How will this happen? I’m glad you asked. . .let’s look at the puzzle pieces from a satellite perspective. Hurricane Sandy with 70 knot (80 mph) winds is bearing down on the eastern tip of Jamaica with a landfall expected this afternoon. Sandy will continue moving north towards eastern Cuba this evening and should emerge on the north coast of Cuba by early tomorrow morning, possibly as a hurricane, but more likely a strong tropical storm. Beyond this point, we know the Bahamas will feel the greatest effects with some rainbands and wind moving towards southeast Florida. What happens in the day 4-6 time frame depends on a couple features. GOES-Sounder RGB Air Mass product with the 12z tropical model guidance for Hurricane Sandy overlaid. The RGB Air Mass image above shows the potent trough that moved ashore the West Coast this morning (circled in red). This will translate east in the coming days being further strengthened by shortwaves over the Northeast Pacific. Meanwhile, Sandy’s projected tracks are shown in the far bottom left with the 12z solutions. How Sandy interacts with this developing/strengthening trough is the real question? SEVIRI RGB Air Mass product of the North Atlantic on 10/24/12. The red circle identifies a developing cutoff low, the blue circle shows an expanding upper-level ridge, and the black circle identifies Tropical Storm Tony. The SEVIRI RGB Air Mass image above shows other players on the field that will play a significant role in this complex evolution. With the NAO going negative, one would expect a strong storm along the East Coast. In this case, the expanding upper-level ridge (blue circle) is retrograding northwest towards the Labrador Sea, while a large cut-off upper-level low (red circle) is going to strengthen and move slowly southeast. This in turn may capture Tropical Storm Tony (black circle) and entrain the energy producing a large ocean storm that completes a Rex Block pattern with a large ridge on top of a large low. This would impede the Sandy/trough interaction from moving out to sea and could push the Sandy towards the trough (most likely as an extratropical/hybrid storm). One thing I’ve noticed is the very expansive easterly fetch across the Atlantic aimed at the Mid-Atlantic and New England. If this materializes, you will have astronomical high tides with the full moon, a large fetch of westward moving water, and the strong winds assisting the storm surge. This all spells the potential for a high impact event. I will try to post an update tomorrow with another snapshot of the features.